Another Travel Leap to Sarajevo! Unexpectedly another giant leap occurred. I went to the bus station to happily leave the tourist syndrome of Budva and head to Kotor. The ticket person said “five minutes”, so I jump on the bus, but the person selling the tickets failed to mention that the bus was heading to Podgorica first. This is a fine example how sicking tourist areas behave, yet, everything turned out for the better. Once at the Podgorica bus station I inquired about heading to Sarajevo. With only a two hour wait I grabbed some lunch, remarkably a good old-fashioned mid-western style meal, found some Internet and the time rushed on to depart for Sarajevo. One bus with two stops and 7 hours later—hello Sarajevo. The high season of the Balkan coast just began and will end at the end of August. The coast of Montenegro and Croatia is over priced and crowded. Most long term travels such as Andy Hobo, and Steve is Lost will avoid overpriced tourist traps, including myself. For many holiday-makers and short-term vacationers the busy touristic areas suit their needs. By the way Steve is Lost finished his travels on day #1804. So today I am Sarajevo, and I can say my first impression is very positive. First, the taxi from the bus station was honest. I arrived at the hostel and inquired for a flat, the guy called a friend and he showed me a room that is separated from their house. A hostel bed runs about 15 Euro in an 8 bed dorm, this private room and bathroom is only 12.50 Euro by staying three nights. In addition, his friend has a flat available on Sunday that I will look at for around 300 euro a month, which is the going rate. I will be staying a least a month here in Sarajevo, but possibly two months through the end of August. Second the food is excellent with a big variety of raw foods and excellent soup. And third, the mind set here in Sarajevo is much more positive that the four countries I have experienced in the Balkans. I inquired about the mind-set and cultural dynamics about Montenegro here in Sarajevo. 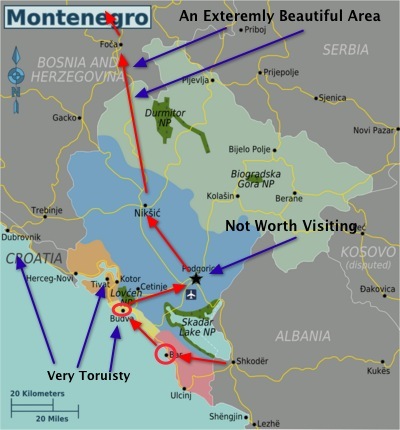 People are very aware that Montenegro is known for ultra laziness and negativity, coupled with a selfish outlook that plays within an odd level of victimization. On the way to Sarajevo, I noticed about one percent of the fields cultivated, only. The fields of Montenegro are barren of crops. Heck, I thought Albania was tweaked. One thing can be said, the Bulgarians are much more efficient and positive than Montenegro. Sure, the Bulgarians can be negative toward work, but when there is work most are hard workers, at least in the villages, and, are very hospitable and honest, at least with myself. Interesting enough, while staying in Bitola in Macedonia there were many people from different parts of Europe visiting for the art festival. Known for its beautiful architecture, art students filled the streets of Bitola. The only people that dressed with their flag hats and patriotic clothing were from Montenegro, and the people of Montenegro staying at the hotel wouldn’t even say hello. Strange wouldn’t you agree? Even if I stayed only five nights in Montenegro, the two homes I stayed were cold, but the flat in Bar was very pleasant. 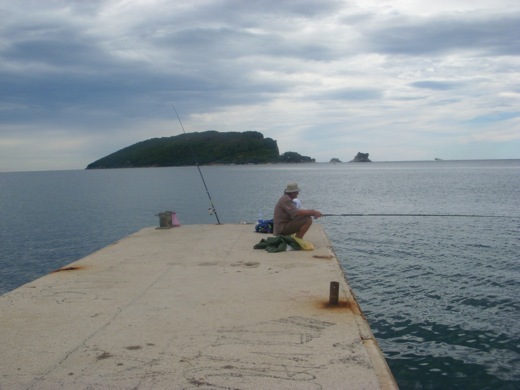 The people in Budva are very unfriendly, cold, and stuck-up; I did inquire about this with expats working in Budva and a couple of people in Podgorica while waiting for the bus, and they agreed. However, the landscape is ultimately beautiful in Montenegro, and traveling through the country to Sarajevo is the stunning Tara Canyon. This location of Northern Montenegro is one of the most beautiful mountain canyon rides I’ve experienced. The cut rock tunnels with no lights amounted over 20 through the Tara Canyon. It is interesting to note that not many travel bloggers consider the Balkans and Sarajevo. It is really difficult to comprehend that Sarajevo was under siege for three years. There are many high rise buildings that show war scares. Yet, the old town is charming and people are smiling displaying a positive demeanor—one guy said that since people viewed dead bloody bodies in the road during the war, they prefer to be positive. The old town and city center are charming and the city expresses a comfortable feel such as when I arrived in Sofia. Possibly more travel bloggers, long term travelers, and one year travelers will consider the Balkans and the city of Sarajevo. Throughout my stay here I will be blogging in detail about the city and what I learn of the war that started in 1992 and ended in 1999. I will mostly likely take some day trips or travel the country before I head north. Moving over to WordPress using Thesis as the framework is noticeably positive. I added some sidebar headers, but will play around with different designs. I added recent traveled posts that are not viewed on the home page, and an antique section that will show old posts of a certain country. Both sidebar widgets will be continually updated. The header rotates as you click around on the site, this is a built in feature of Thesis. I refrained to add any slider plugins because those add-ons only slow the site down. I added travel route maps on the page “Travel Path” a subpage under “About“, now you can view each country and the travel route. In addition, I am adding my current travel route mapped out within several posts. I will be updating the About Page with more information about this site and the idea of Travel Enlightenment including the short Bio and Why Travel. I might be possibly adding a weekly flashback post. One reason is for SEO purposes. Blogger never indexed all my posts after I bought the Google domain name, and all those posts, about 260, are indexed with my new domain name because I was able to forward the old domain with a 301 but also changed the DNS. I have about 400 post in total. So I think I will began a weekly flashback post with one picture, a short description, and the link to the article. It is slightly strange, when I actively travel the comments decrease. When I stay put in one place, the comments increase. If I write about the weather, the comments received are in the double digits. If you are wondering how I make the map arrows, and the header and tag titles on the header pictures, I use an incredible and helpful Mac program called Voila. I also use the Mac built in Automator program to crop and rescale the pictures. Any design work from scratch I use a free program called seahorse, similar to Photoshop but without the cost and the mega-size. There are two programs that I use continually, Voila and Cute Clips. Voila is a tool for expressing your ideas using images and videos. You can use Voila to capture images and record videos, annotate and add effects to the images, and organize and share the captured images and videos. Cute Clips allows the user to access prior copied text by hitting some keyboard shortcuts, plus it allows to create stickies. I will have more posts and pictures up soon of Sarajevo. 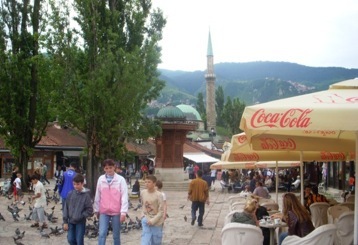 Next post: Rainy Sarajevo with American Tourists, and a Slight Change. 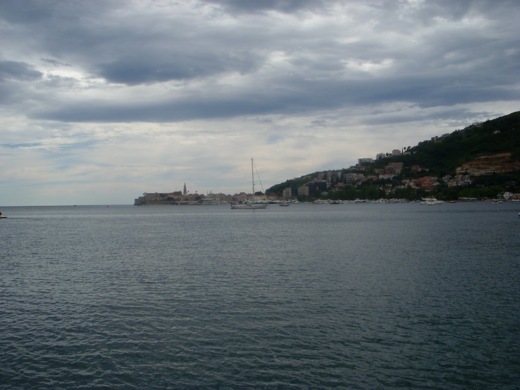 Previous post: Budva, Montenegro’s Tourist Trap!